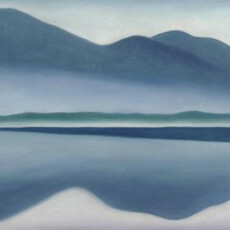 In our last exploration, we dug our heels into the Georgia O’Keeffe Lake George exhibit at the DeYoung museum this spring. I hope I did an adequate job conveying what an important role that museum visit played in forming questions for me about the process of art as well as seeing her own style change. 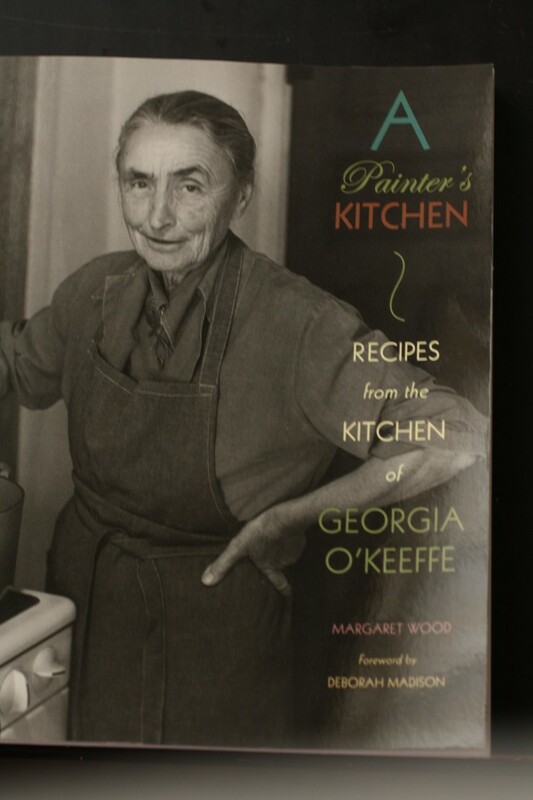 As I exited the exhibit, I happened upon a small book in the gift shop and had to work hard to contain my glee as I held A Painter’s Kitchen: Recipes from the Kitchen of Georgia O’Keeffe by Margaret Wood. I clutched my new treasure and pedaled home quickly to plumb its depths. Little did I know then that O’Keeffe prized good food and did due diligence to seek out nourishing recipes! The cookbook features a foreword from local Bay Area vegetarian chef and powerhouse, Deborah Madison of the restaurant, Greens, in Fort Mason, and author of Vegetable Literacy as well as my marked up favorite, Vegetarian Cooking for Everyone (I have the original printing of this now updated cookbook). Her description of the book is right on when she says, “No dish is encumbered with complicated embellishments; there are no intricate layerings of flavors and textures.” (p. x) This insight perplexed me a bit because when I think of O’Keeffe’s artwork, all I can envision are intricate layers, though no embellishments. Does her artistry reside solely on the canvas? The recipes enclosed in this book are brief in method and ingredients. I read the book in two days, annotating along the way. Madison quotes biodynamic gardener, Alan Chadwick:”The cooking has been done for you in the garden; it’s merely finished in the kitchen.” (p x) This really gets to the heart of A Painter’s Kitchen. O’Keeffe kept a ranch garden from which most of her meals derived since the alternative for fresh fruits and vegetables was 70 miles away. Margaret Wood describes meeting O’Keeffe and beginning to cook for her when she was 24 years old and O’Keeffe was 90. Her stories and details about O’Keeffe in the headnotes are the real reason to pick up your own copy of A Painter’s Kitchen. From it, I learned that Georgia O’Keeffe occasionally slept on her roof under the stars. What a way to dream! 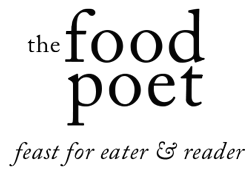 Woven throughout the headnotes are snippets of her practical wisdom, such as this comment from a dinner she held with two visiting poets: “It’s easy to talk about what you’re going to do- you can talk yourself right through without really doing anything.” (p. 44) This was not the first time poetry was mentioned in the cookbook, as Wood remarked on O’Keeffe’s appreciation for Chinese poetry. The food being served from O’Keeffe’s Ghost Ranch kitchen focused on healthy ingredients, and centered on vegetables from her garden, organic grains and meats. I smiled visibly when I read that O’Keeffe made her own bread using a small mill to grind her own flour, while the housekeeper canned and preserved foods. Her approach to scratch cooking and concern over food sourcing parallels contemporary cooking in my neck of the woods and home (although I play the role of cook and housekeeper).Wood describes O’Keeffe’s style of eating as “simple food… with fresh and pure ingredients.” (p xxi) That neighbors would bring her food gifts of wild asparagus because it delighted her reminded me of why I appreciate her art and compositions. You can tell from reading the cookbook that this experience working with and for O’Keeffe left an indelible mark on Margaret Wood- the kind you want to share with others. The glimpse she provides to other fans of O’Keeffe’s artwork is one that is intimate, as if inviting us to join them at the table. This cookbook lives with my others but I like to keep the cover faced out, so that when I am cooking, if I happen to glance in the direction of my cookbook collection, Georgia O’Keeffe is smiling out.